When working with a laptop, it is very common to plugin external mouse for ease of use and accessibility. Most laptops have dedicated shortcuts or buttons to disable touchpad when you plug in an external mouse. However, if needed, you can configure Windows to automatically disable touchpad when external mouse is connected. This eliminates the need to manually disable the touchpad each and everytime you connect external mouse. It is pretty easy to do. So, without ado, let me show you how to do it. There are multiple ways you can go about it. I will show all three ways you can automatically disable touchpad when an external mouse is connected. Pick the method of your choice and follow the steps. You should be good. Note: If your laptop doesn't support precision touchpad then this method won't work. Follow the other two methods. The settings app has proper options to configure Windows 10 to disable touchpad if external mouse is plugged in. 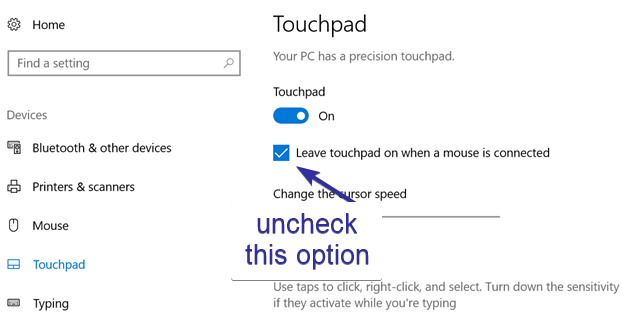 All you have to do is select a single checkbox and Windows 10 will turn off the touchpad on external mouse connection. Go to "Devices -> Touchpad" page. On the right panel, uncheck the option "Leave touchpad on when a mouse is connected". That is it. The changes are saved instantly. From now on, whenever you connect an external mouse, Windows automatically disables the touchpad. Of course, when you disconnect the external mouse, the touchpad will be enabled automatically. You can also configure Windows to automatically turn off touchpad when you connect external mouse to your computer via the good old mouse settings in the Control Panel. This is method works on Windows 10, 8 and 7. Find and select "Mouse" option. Find ELAN or Device Settings tab. 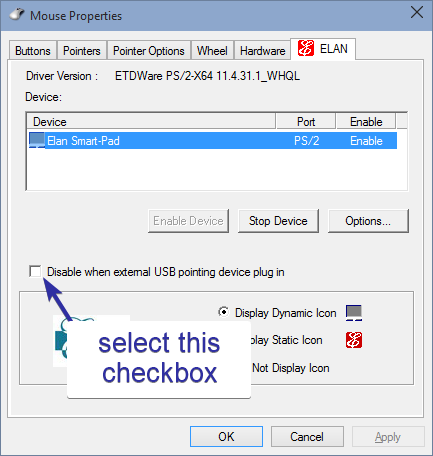 Now, find "Disable when external USB pointing device plugin" or "Disable internal pointing device when external USB pointing device is attached" and select the checkbox. That is it. From now on, whenever you plug in an external mouse, the touchpad will be disabled automatically. You can also make registry edits to automatically disable the touchpad when you plugin external mouse. Though it is easy to do, I recommend you backup registry before making any changes. On the right panel, select "New -> DWORD (32-bit) Value". Name the value as "DisableIntPDFeature". Double-click on the newly created value. Type 33 in the value data field. That is all. Restart your system and you are good to go. If you like this article, you will also like to learn how to enable sandbox on Windows 10. Sandbox is pretty helpful to test software and new settings.